Policy-making can be defined as ‘the process by which governments translate their political vision into programmes and actions to deliver outcomes’. A solid, well-grounded and robust policy aquaculture framework is required as a basis for sustainable development and its contribution to food security and economic growth. A policy provides the well-considered sectoral goal and objectives that are essential for subsequent strategy and development planning. A marked reluctance for private sector investment in aquaculture in the Pacific compared to other similar bio-geographic regions. 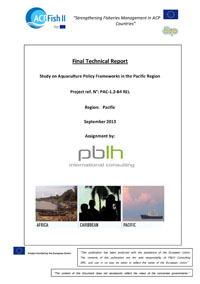 The purpose of this study was therefore to evaluate the policy-making needs of the 15 ACP countries in the Pacific Region and to provide a set of practical guidelines for developing an aquaculture policy framework. This study has been implemented by the ACP Fish II Programme with European Union (EU) funding.